In the 1980's, Professor Noriaki Kano developed a system of product development and customer satisfaction to help classify customer preference and focus business effort. This system is called the Kano Model, and is used in many industries around the world today. Companies today use the Kano Model to help identify what their customers really value in their products. This can be helpful to determine how to change or improve a product, and can also be used to evaluate whether a new product that is being considered is a good idea. The Kano Model works by breaking the features of products down into groups based on how they contribute to customer satisfaction. There are five categories identified. A product or feature of a product can be listed in any one of the categories. The category that it is in, however, can change over time based on changing attitudes of consumers. Any product or feature that is in the must-be quality category are going to be requirements from consumers. This is not to say that customers 'really want' them, but rather that they take them for granted. While it might seem that products in this category would be great marketing points, that is not typically the case. When a must-be quality feature is done properly, consumers won't really notice them. When they are done incorrectly, customers will be extremely upset. An example of this would be the door on a vehicle. Customers want the door to open and close easily, lock and unlock conveniently, and have windows that go up and down without trouble. This is just an expected feature of every vehicle, and customers don't put much thought into it at all. If a car was made with a door that didn't work, however, customers would not purchase that car. A one-dimensional quality product or feature is one that, when delivered upon properly, will drive customer fulfillment. If it fails to deliver, customers will be dissatisfied. These items are typically used as part of marketing, and talked up to boost sales. An easy example of this when a product advertises saying, 'contains 10% more than the competitors.' If the container does indeed contain 10% more, customers will be happy about getting a good deal. If the container actually only contains 5% more, customers will be upset because they were lied to. In the example, the numbers would be real, but this can also apply to perceived failure to meet the promise. If a company says 10% more by volume, a customer may weigh the product and find that they aren't getting 10% more than the competitor, even though by volume, there is 10% more. This is why it can be so important to look at consumer perception, not just raw numbers. An attractive quality is one that will cause increased satisfaction to customers when done, but won't cause dissatisfaction when the feature is missing. In most cases, these features won't be something that is advertised, but rather will be a 'pleasant surprise' when the customer finds it on their own. This could be something like a coupon for their next purchase printed inside the box. In many industries, the features that are listed under this category are what are most often used to set a product apart from the competition. When a base version of a product is similar no matter what company makes it, it is these attractive qualities that can help to swing a customer to one brand over another. Focusing on attractive quality features is also smart because in the event that the feature is not implemented properly, customers still won't be upset about having it there. This helps to limit the potential downside (other than the expenses associated with it) and maximizes the upside potential. Each industry will have to determine if this is a good strategy for their particular situation. An indifferent quality is something that customers won't care about one way or the other. In most cases, they aren't even aware of these types of features. In a cereal box, for example, an indifferent quality would be the thickness of the cardboard that is used. As long as the box holds the cereal, they don't care how thick it is. Manufacturers need to make this decision based on factors like cost, shipping durability, and more while keeping in mind that the end consumers won't ever give it a second thought. Reverse quality features can cause consumer dissatisfaction, even when done properly. This is typically due to the fact that not all customers are alike, and requires brands to be well aware of their target audience. Smart Phones are a good example of this. Adding advanced technology to phones takes a lot of investment, and should be done with the understanding that a portion of the market will be dissatisfied because of the complexities that advanced technologies bring. Using the Kano Model allows a company to take information from consumers, and apply it directly to the planning and creation of products. Companies can conduct consumer surveys and use the information that is put into this model to evaluate whether a particular product or feature is worth the time and capital that it would take to create and produce. The information can also be used to come up with products or features that customers are more likely to want to purchase, since a company will have a better idea of what types of things they demand. Implementing the Kano Method is an easy process that will primarily be focused on gathering information, and training employees to use it properly. In most cases, only specific employees will need to be given the education required to properly use this method, which can help to streamline the implementation of the Kano Method into practice. One important thing to keep in mind when implementing the Kano Model is that in the end, customer satisfaction is going to be the main measuring stick. This system can also help to eliminate waste and improve efficiency by only putting effort into things that customers want, but customer satisfaction is primary. 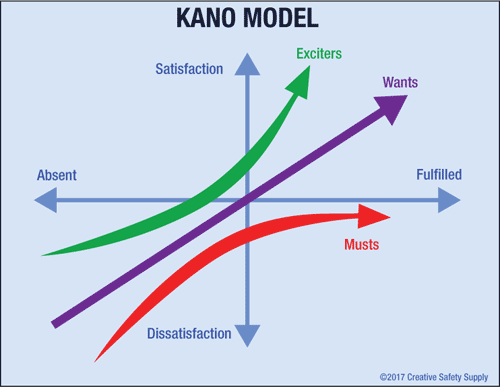 When implementing the Kano Model in a facility, other company strategies should be looked at to see how Kano and the others can complement each other. 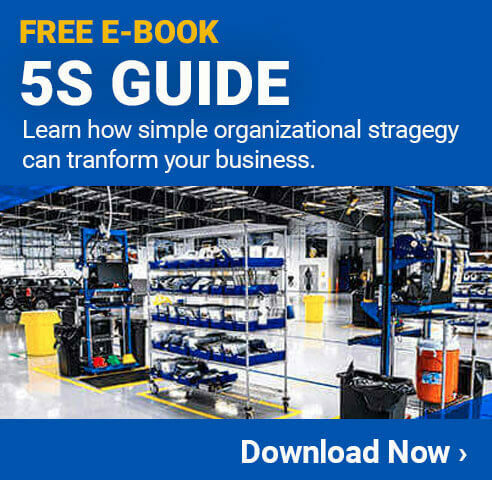 Given the fact that the Kano Model can help eliminate waste by identifying features or services that don't add value to the customer, it can be an important part of 5S strategies taking place within the facility. 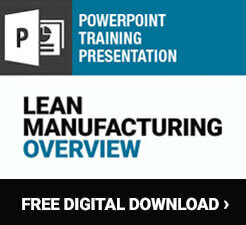 It can also be implemented alongside lean strategies in manufacturing, medical, office, or other environments. These are very complementary strategies that can benefit from being in place and used to accomplish waste elimination, and improved customer satisfaction. 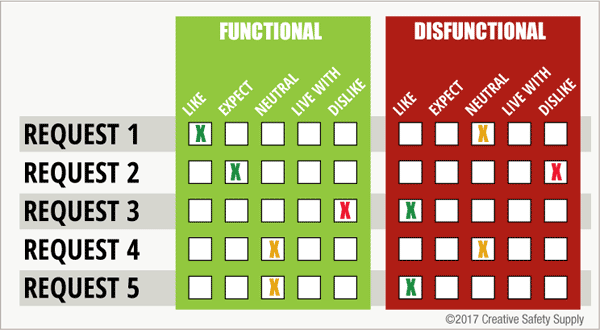 There are many Kano Model templates out there for completing different tasks more effective. Using a template for a Kano Survey will help ensure all the necessary questions are asked in the proper way, and that the information gathered is able to be properly used. Using a template to track customer requests can also help to keep information in a more understandable format. This image shows how customer requests can be classified using the categories from the Kano Model. One of the easiest ways to understand how the Kano Model works in practice is to look at some real life examples. These examples show how certain things start off in one category of the model, and can move to other areas over time. A great example of this is the cell phone battery. When smart phones first came out, they had batteries that didn't last too long, and were often quite bulky. People accepted this because the technology was new and the smart phones were performing things that many people never dreamed they could. Other types of things will start off, and remain, in the same category indefinitely. Businesses need to be able to follow features and products closely so they always know how they fit into the Kano Model. Consistently gathering information from customers, and using it to evaluate how to change or improve products in order to maximize customer satisfaction and return on investment.